Observation: wear increasing from one edge to the other with a fine rubber flash or "feathering" present on the longitudinal edges. Probable Cause(s): incorrect alignment of the front or rear wheels. 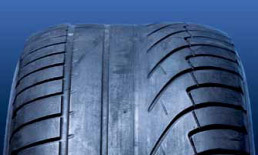 Tyre: can be kept in use if it meets the legal requirements. 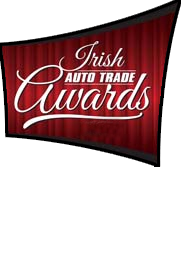 Vehicle: adjust the vehicle's suspension geometry (alignment) according to the manufacturer's specifications. Observation: wear more pronounced in the centre of the tread than on the shoulders. Probable Cause(s): tyre over-inflated or lightly laden. 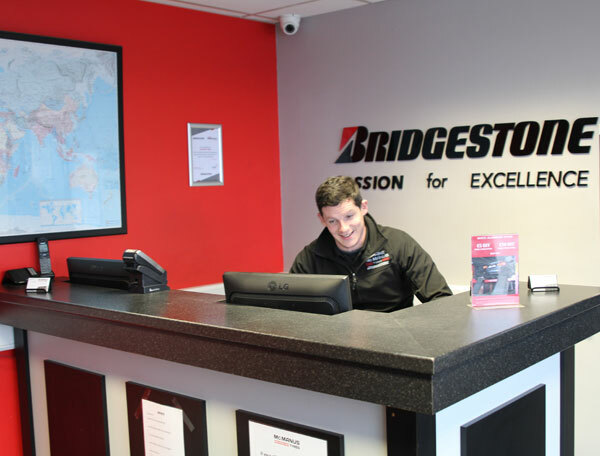 Tyre: verify and reset the pressures when the tyre is cold as advised by the vehicle or tyre manufacturer. May continue to be used if it meets the legal requirements. 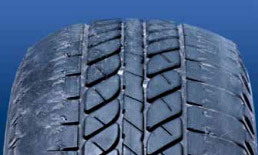 Observation: wear more pronounced on the shoulders than at the centre of the tread (rounded wear). Probable Cause(s): running under-inflated and/or overloaded. Look for the cause of under-inflation and correct it (neglect, puncture, valve, etc...). 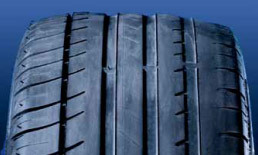 Tyre: may continue to run if it meets the legal requirements, and the structure of the tyre has not been affected. Probable Cause(s): generally found on non-driven rear axles. This kind of wear is normally the result of the combination of several vehicle factors, such as: - incorrect suspension geometry setting (rear wheels). - faults in the suspension. 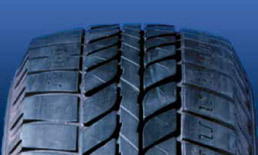 Tyre: may continue to be used if it meets the legal requirements and does not cause vibration. 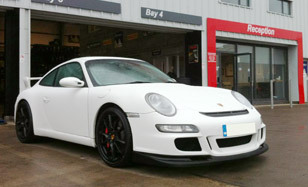 However, the tyre should not be used if it contravenes the legal requirements or causes vibration. 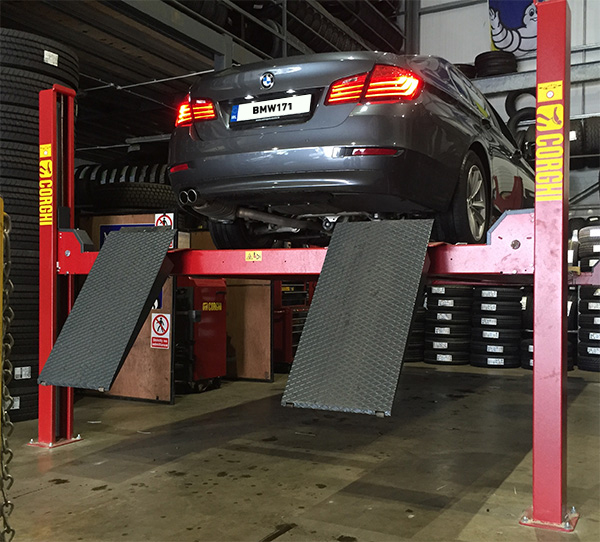 Vehicle: check the vehicle's wheel alignment and the suspension components. Observation: localised deformations with or without signs of impact (cuts, grazing etc...). Probable Cause(s): this deformation is the consequence of the accidental rupture of one or more cords in the casing ply caused by: - severe impact with an obstacle (pavement, pot hole, etc...). - crushing of the sidewall between an obstacle and the rim. This type of damage can be exacerbated by incorrect inflation pressure and overloading. 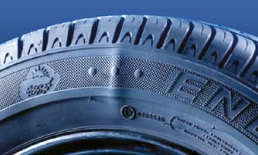 Tyre: to be withdrawn from use. 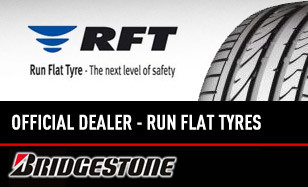 Vehicle: check the condition of the rim. 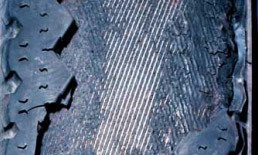 Observation: part or all of the tread torn off. Probable Cause(s):these tears are the result of delamination between elements of the internal structure, generally caused by: - excessive heat build-up due to: running for long periods under-inflated or overloaded, a fitment which is not in line with the vehicle manufacturer's recommendations (load and speed rating), widespread oxidation of the internal metallic structure due to cuts, perforations and various forms of tread damage. 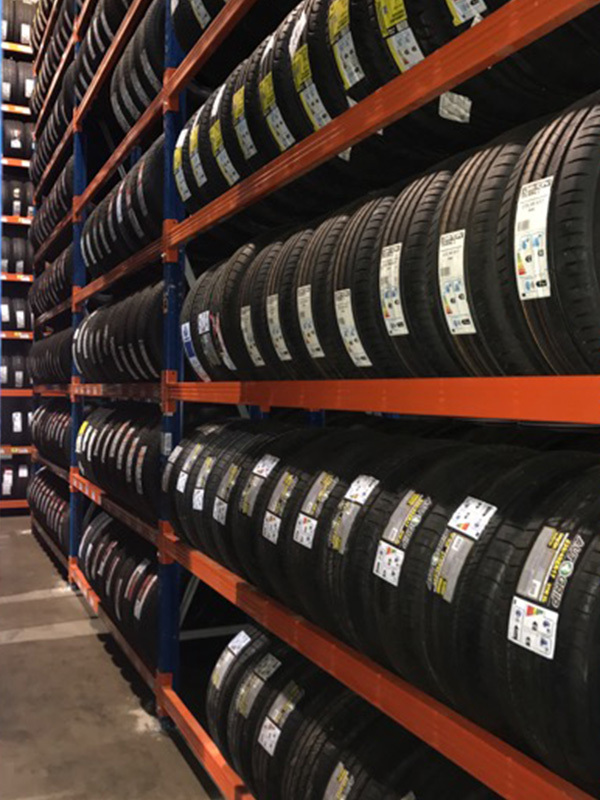 Vehicle: check all the tyres on the vehicle - follow the vehicle manufacturer's recommendations (load/speed ratings) - check and set the tyre pressures as recommended by the tyre manufacturer and/or vehicle manufacturer.